I recently made this mash-up of two previously posted recipes here on S&SK, acorn squash with Indonesian rice and stuffed pumpkins. This was so delicious, I thought I’d create a post of its own! I think my favorite thing to stuff these days is Kabocha squash, also called Japanese pumpkin, because of their creamy texture and superior flavor. Even though the picture in this Wikipedia post is green on the outside, I have only seen the red variety in our local coop. I imagine the flesh inside is equally delicious in both! Purchase squash of 2-3 pounds. Each squash will serve 2-4 people depending on size and other components of the meal. Make the Indonesian rice, as specified in the acorn squash recipe. It should be on the wet side. Follow the directions for preparing and baking the squash in the stuffed pumpkin post. To recap, pre-heat the oven to 350F. You’ll then cut a “lid” from the top of the squash and then remove the seeds. Don’t throw away the lid! Rinse out the inside and then stuff with the rice. Put the lid back on the squash. Place stuffed squash on a rimmed baking sheet lined in foil. Bake in the oven for 90 minutes. Remove the lid and bake for another 20-30 minutes. You should be able to easily pierce the squash with a knife or cake tester. Remove from the oven, put lids back on and let sit 20-30 minutes. Cut into wedges and serve! Here’s a pic of the finished product before cutting. Back in the relaxing days of only having one small child, I used to watch a lot of daytime TV. My son would only nap for long stretches when he was laying on me…if I tried to lay him down in his own bed, on our bed, or on the couch, he would wake up within 10 minutes. And then would be crabby for the rest of the day. Luckily he was my first born, and got lots of snuggles on the couch, every day, for the first 2.5 years of his life. It got frustrating: dirty dishes would sit in the sink, phone calls would go unanswered, laundry would sit in the dryer, dinner would go un-prepped. I had no smartphone, so no emails, Facebook, or Words with Friends. So, I watched A LOT of television. And after I had marathoned Doctor Who, Firefly and Veronica Mars on Netflix (thank goodness we had Netflix), I turned to daytime TV. And a whole bunch of Food Network. And I’m actually glad for it, because I learned a bunch of really great cooking tips from Ina, and quick meal ideas from Rachel and Giada. This was one of them, and I make it on a pretty regular basis. I remember it was on an episode when Giada was cooking with a child, so it’s meant to be a good recipe for a kid to help with. Which is true, my son has helped me make it many times. It can be prepared in about 30 minutes. A great weeknight meal! This makes enough for 4 people, in an 8×8″ glass baking dish. I like to double the recipe and bake in a 13×9″ dish so we have plenty of leftovers. Meanwhile, put the olive oil in a medium saute pan over medium heat. Add the chicken and cook for 3 minutes. Add the onions and garlic, stirring to combine, and cook until the onions are soft and the chicken is cooked through, about 5 minutes more.Put the chicken mixture into the bowl with the cooked pasta. Add the canned tomatoes, mozzarella cheese, parsley, salt, and pepper. Stir to combine. Place the mixture in a buttered 8 by 8 by 2-inch baking dish. In a small bowl mix together the bread crumbs and the Parmesan cheese. Sprinkle over the top of the pasta mixture. Dot the top with small bits of butter. Bake until the top is golden brown, about 30 minutes. Note: This can also be made with already cooked chicken. Just saute the onion and garlic on their own, and add the chicken to the bowl with everything and toss. I’ve been making these sautés for a while now, using veggies that are in abundance this time of year. The source of my idea was this sweet corn sauté from a couple of years ago. I thought it would be delicious with other vegetables and maybe some pasta. And maybe a little Parmesan . . . what’s not to like when Parmesan cheese is part of the equation?!! This is ultra flexible and the “3-Ways” reference is that it can be served as a side with a couple of variations and as a vegetarian main dish with small pasta shapes added. I made it last night in about 45 minutes, including chopping and cooking the pasta. Pretty fast, I would say! 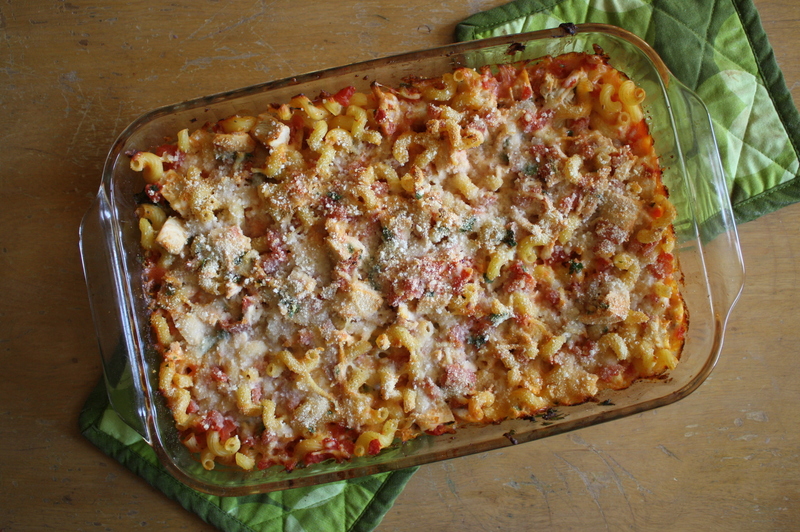 When Aunt Suzy mentioned a new easy pasta dish for dinner, I was all for it! 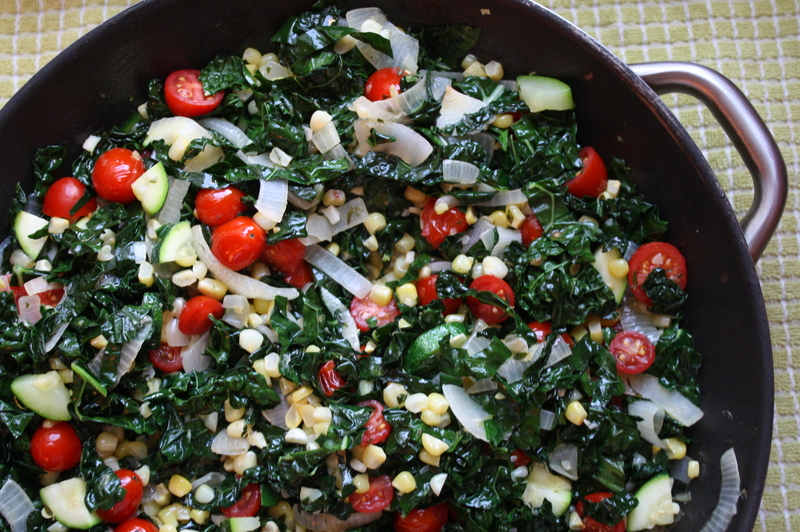 I love the sweet corn saute dish that she mentioned, and make it pretty often in the summer. 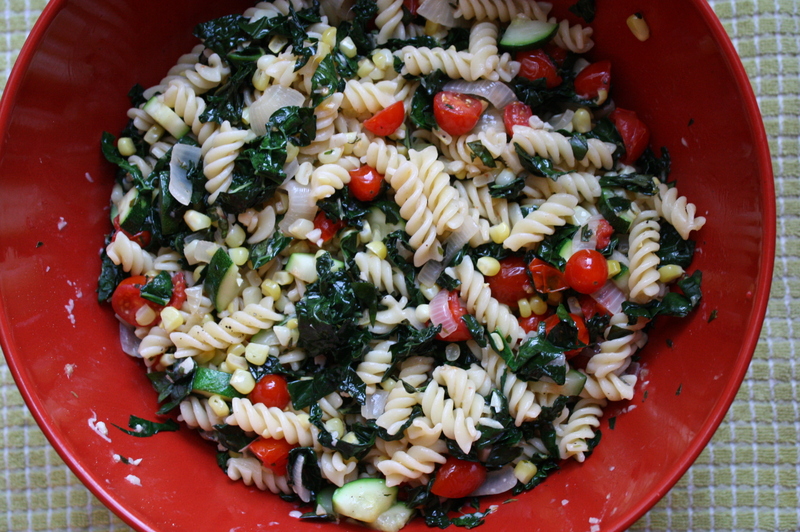 I loved the idea of adding pasta to it, along with the kale, zucchini and tomatoes. And it’s beautiful when you add the tomatoes! We were all oohing and aaahing about it while I was taking photos. I will definitely be making this again before summer is over. 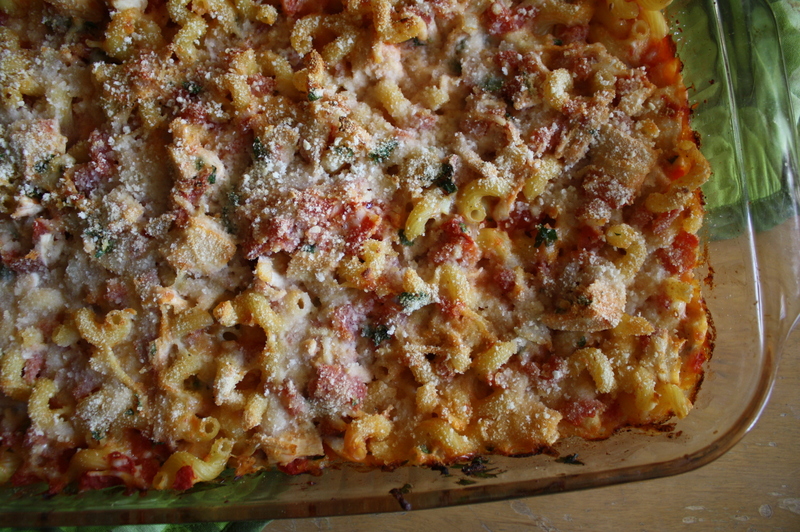 It’s delicious with the pasta and Parmesan! Prepare all veggies before starting cooking because there is no time to chop once the cooking is started! Place a large saute pan over medium heat and add the olive oil. Once it is shimmering, add the butter. When butter is melted and bubbling, add the onions and turn up heat slightly. Cook the onions for about 5 minutes till they become translucent. Add the thyme, oregano and garlic and stir/cook for about a minute. Add the sweet corn and cook, stirring for 2 minutes. 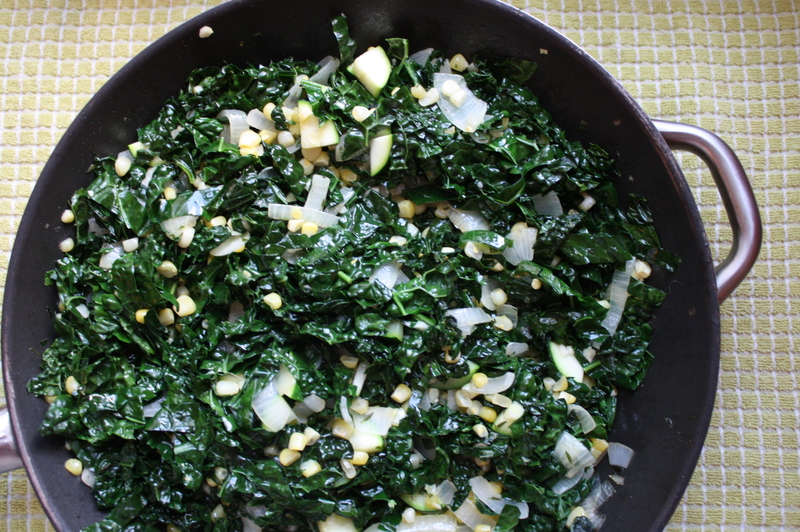 Add the kale ( and optional zucchini if using) and cook stirring for about 3 minutes. Put a lid on the pan and cook another 2-3 minutes. You can serve this as a side dish – way #1. However, if you want to keep going, add the tomatoes. Cook for 2-3 minutes stirring then place a lid on the pan and cook another minute or two. This is way #2 – an awesome side dish as well! Maybe add the fresh basil or serve as is. To make the main dish with pasta, add the pasta to the veggies with a little of the reserved water. Stir to combine completely and add the fresh basil. Once served pass the Parmesan! 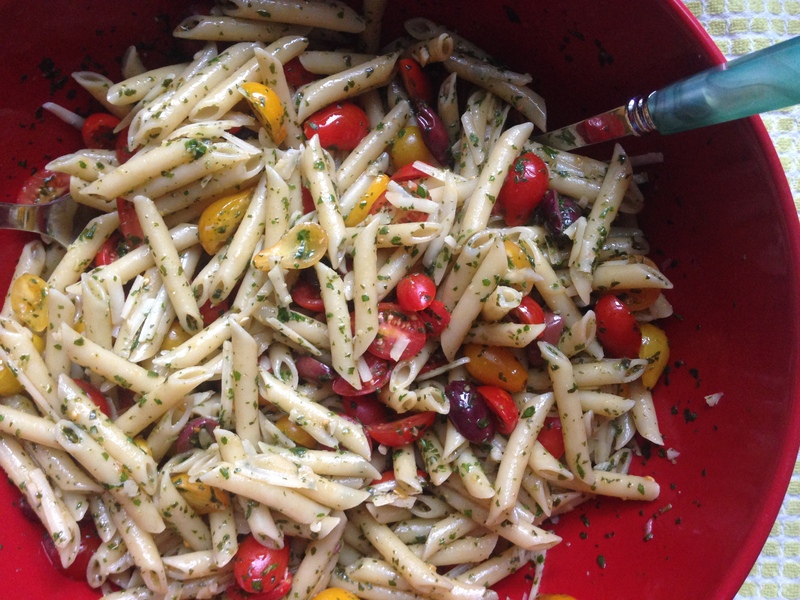 This pasta salad caught my eye on “Food and Wine” because of the olives and tomatoes…I really love that combo of flavors in a pasta salad. But what made this excellent is the mixed herb pesto that you toss it with, and the shaved pecorino that you toss in after it’s completely cooled, so that it doesn’t melt. This dish has a ton of flavor and will be in regular rotation on our “pasta Wednesdays” in the summer! Cook the penne in a large pot of boiling salted water until al dente. Drain the penne and toss with 1 tablespoon of the olive oil in a large serving bowl. Let sit to get to room temperature. Meanwhile, in a blender, puree the basil, parsley, garlic, thyme, marjoram with 1/3 cup of olive oil. Add more olive oil if you think it’s necessary…the original recipe called for 1/2 cup, but I felt that was a little much. Scrape into the bowl with the pasta and season with salt, then toss together. Then toss in the tomatoes and olives and let stand at room temperature for at least 10 minutes to develop flavor. Just before serving, add the Pecorino, season with salt and pepper and toss well. MAKE AHEAD The pasta can be tossed up to 2 hours ahead. I love pesto, but I’ve been wanting to try new things besides basil pesto. This kale pesto is really yummy, and can be used in a number of ways: on a sandwich, in an egg scramble, on chicken or fish, on pizza (which we did the night after we had it on pasta…yum! ), or, of course, on pasta. 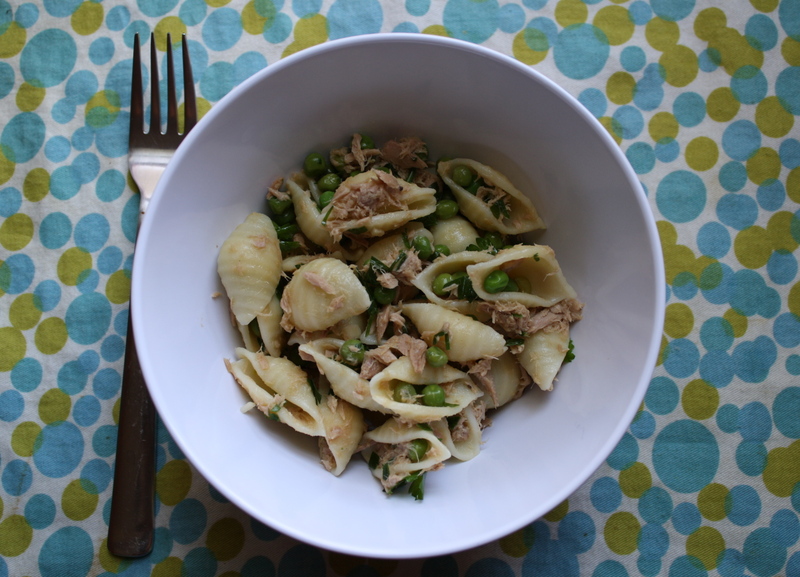 This recipe is enough to cover a pound of pasta, plus extra for other things on later days. It really freezes well, too! Bring a large pot of water to boil, add kale and boil for about 30 seconds. Immediately drain kale and run cold water over it to cool it off. Squeeze off excess water and put in food processor, along with nuts, garlic, lemon juice and zest, salt and pepper. Process for about 30 seconds, until its all ground to a fine meal. Scrape down the sides and pulse a few more times. With the processor running, add the olive oil in a steady stream. Scrape down the sides again, taste, and add more olive oil if needed (and salt and pepper), and pulse a few more times. The consistency isn’t as creamy as basil pesto, and I found that I needed more olive oil than with basil pesto. I think I used almost 1/3 cup. If making pasta, cook your desired type of noodle to al dente and place it in a large bowl, reserving some of the pasta water. 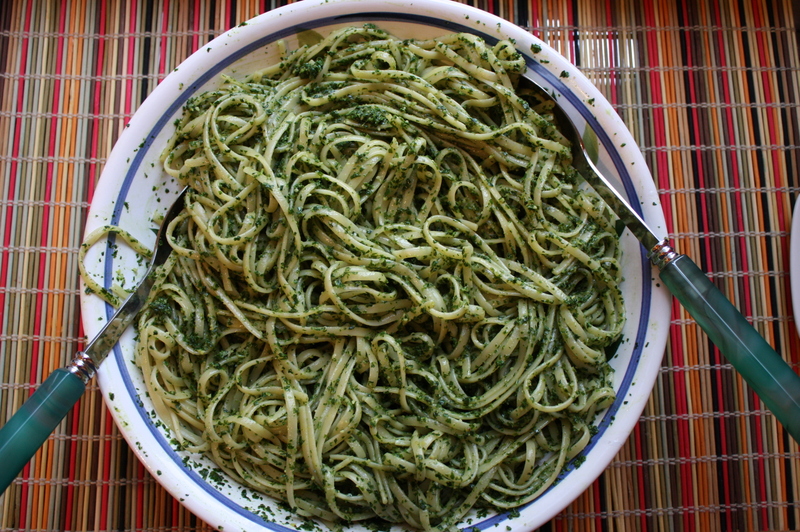 Add about half the pesto to the pasta, and combine thoroughly, adding up to 1/2 cup pasta water as needed. Serve immediately, topping with parmesan cheese, and maybe a little toasted walnuts for garnish. It’s also really good with some halved cherry tomatoes stirred in. I saw this recipe from Bon Appetit while planning a family trip to Illinois. I sent it to Margaux’s Mom Kathleen where I’m staying and she gave it a thumbs up . . . and that was only on paper :-). I made this a couple of days ago and we both agreed it’s a Wow! A pretty fast and easy wow at that. We served with a green salad and a Sauvignon Blanc. My niece Malory’s kids are sick so I asked if I could get her some groceries, and she requested most of the ingredients in this recipe. So I shared it with her and she made it last night – so not only did adults like this but it has been kid-tested also. And, thanks for the photo, Malory! Malory says . . .
As Aunt Suzy mentioned I have three sick kiddos, ages 5 and under, so as you may be able to imagine I am a little worn out! Deciding what’s for dinner is never an easy task and the same recipes can get very monotonous. What I love most about this simple recipe is that it takes the same ingredients I usually have on hand and mixes it up for a great flavorful dish! My tastebuds were in heaven! My kids loved it too and even asked for seconds. Next time I will definitely be doubling this recipe! Cook the rice: Heat one tablespoon olive oil in a medium saucepan. Saute about 1/4 of the chopped onion till soft then add the rice and saute until it has a nutty aroma. Add the 3 cups of water, bring to a boil and simmer for 30-45 minutes until water is completely absorbed. When done, add a handful of cilantro if you wish. While the rice is cooking . . .
Cook the beans: Saute about 1/3 of the remaining chopped onion in one tablespoon olive oil till soft. Add the spices and saute a minute more. Add the beans and water, bring to a bubble, turn down the heat and simmer 8-10 minutes, stirring occasionally and mashing a few beans. Take off heat and set aside. Make the salsa: Place the remaining onion, chiles, garlic, ginger and lime zest/juice in a blender container. Pulse to a chunky consistency. Pour salsa into a bowl. Assemble the dish: For each serving, place rice into a bowl and top with some beans. Sprinkle with cilantro, some avocado and cheese. 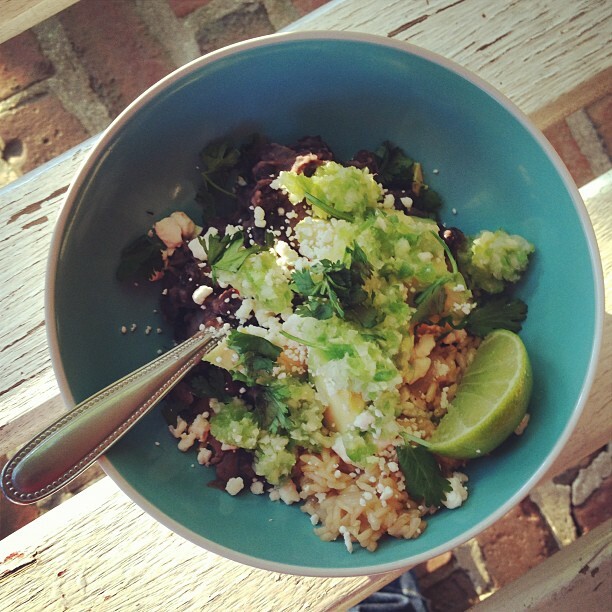 Top with the ginger-lime salsa. Pass the lime wedges.